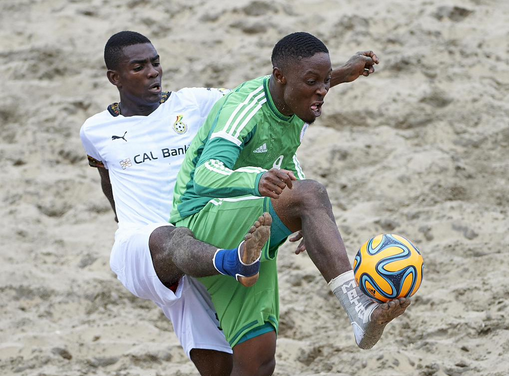 Chairman of the Local Organizing Committee of the Lagos 2016 Africa Beach Soccer Cup of Nations, Barrister Seyi Akinwunmi said on Thursday that the Committee is all set to host a tournament that the whole of Africa will be proud of. Akinwunmi, who is also 1st Vice President of Nigeria Football Federation, assured that a lot of work has been done by the Committee to guarantee that Nigeria will set a marker for future hosts of the continental beach soccer showpiece. “The LOC started real work right from that day in Kaduna (24th March 2016) that we were inaugurated. Hosting a continental competition is no picnic and we knew right from the beginning. The tournament, scheduled for the Eko Atlantic Beach 13th – 18th December, will see Nigeria, Egypt, Ghana and Cote d’Ivoire playing in Group A, while defending champions Madagascar tackle Libya, Morocco and Senegal in Group B.
Thenff.com learnt on Thursday that a 3,000 –seater arena (an upgrade of the venue that has annually hosted the COPA Lagos Invitational Tournament) will host the finals, which the LOC has promised will include the the biggest food festival in Africa, a Fan Zone to engage spectators in a relaxed atmosphere, Beach Soccer Clinic for kids, concerts and live music. Chairman of the Lagos State Sports Commission, Hon. Deji Tinubu says the Commission will work closely with the NFF and the LOC to ensure that the purpose of hosting a tournament that will do Lagos State and Nigeria proud is served. This is the second time that CAF is taking charge of the tournament, which has previously been organized by Beach Soccer Worldwide. Nigeria finished third at the last edition in Seychelles in April 2015. The two finalists at the six –day championship will fly Africa’s flag at next year’s FIFA Beach Soccer World Cup in The Bahamas.